Dollies for drapery or soft goods. 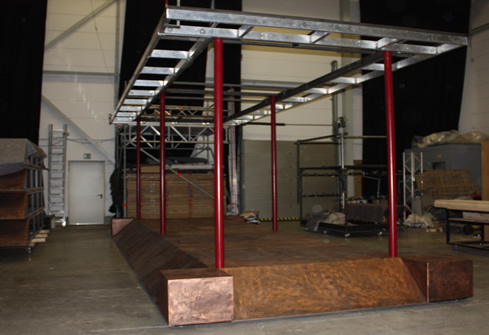 In our own workshops we build stage sets for theatre or touring productions and furnitures for exhibitions, custom made. We provide high-quality, bespoke production services for our clients with precise attention to detail. The above picture shows the making of of one of the exhibtion tables for the touring production of "King Tut /Tutanchamun - His Tomb and the Treasures". 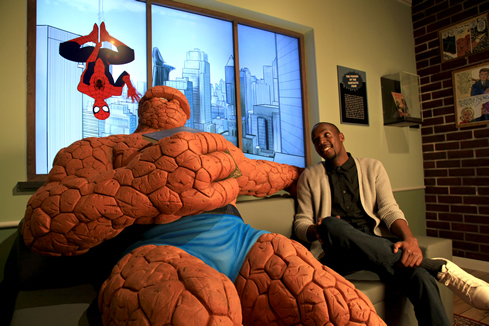 The following picture shows the finished one in the exhibition. 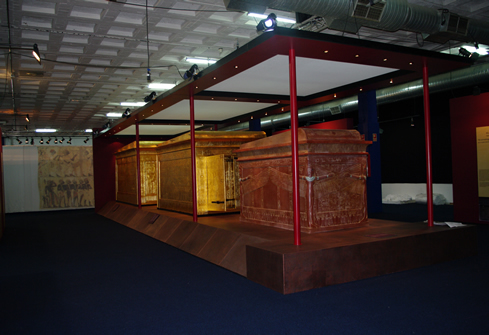 For the touring exhibition of "Tutanchamun - His Tomb and The Treasures" we also developed and built transport solutions for more than 1000 exhibition objects of most different sizes to assure that all exhibits will be well received on the move to another city. We build custom made dollies like costume dollies, stage hampers, stage manager's desks, transport solutions for wigs, requisites etc. . If you need any transport solutions for your production, please, call us or send us an email.